This is the eighth time since 1963 that the Iron Bowl has featured two teams ranked in the Top 10. Auburn has won four of the seven games, including the last two. The most recent was the 2013 edition settled with the 'kick-six' that was one of the craziest finishes to a game in recent memory. This game has very significant playoff implications - for both teams. The winner of the game will win the SEC West and face Georgia in the SEC Championship Game. Alabama controls their own destiny - if they win here they are likely headed to the playoff even if they don't beat Georgia. That would definitely send Auburn to a lesser bowl game. If Auburn wins this game, though, then they have a good chance of becoming the first ever two-loss team to make the playoff. They likely need to win against Georgia again, though, because it would take a whole lot of things going their way to make the playoff with three losses. The Iron Bowl is almost always a classic, but the stakes this year should all but guarantee another great game. There are two big matchups in this game likely to define how things turn out, and we'll look at both. First up is Auburn's run game against the stiff Alabama run defense. Auburn has only failed to gain at least 200 yards on the ground twice this season - and they lost both games. They are very reliant on a dominant run game to fuel everything positive that they do. And here's where it gets interesting - Alabama has not allowed a team to gain 200 yards all season. Mississippi State came closest with 172 yards, and that only came 3.5 yards at a time so it wasn't like the Tide were completely exposed there by any means. The Bulldogs succeeded due to persistence, not excellence. Alabama doesn't have the best run defense they have ever had, but it is still among the best out there. Of course, they haven't faced a run game this strong, either. 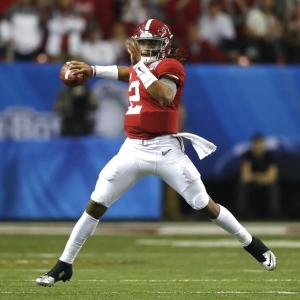 Second, there is a question as to whether Alabama can protect Jalen Hurts. This is not a spectacular Alabama offense, but it is better when Hurts has time to find what he can best do. Alabama does not have a great line when it comes to stopping sacks at the best of times, and now guard Ross Pierschbacher is hurt and out of the lineup. Auburn has a Top 10 pass rush. When Hurts has time he can do some damage - mostly by finding Calvin Ridley, who is by far his preferred target. When he doesn't have time, though, then Alabama becomes much easier to play against - whether Auburn can run like they want to or not. Another factor to consider in this one is seasoning. Alabama exposed Florida State in the opener and has since played a schedule that is frankly a bit of a joke for a team of their caliber. Auburn beat Georgia and lost to Clemson already, so this is the second No. 1 and third Top 5 team that the Tigers have played. Alabama has a lot of institutional experience, but this year alone the Tigers have been much more tested. The game opened with Alabama favored by a little as three points, but the wider opening number as four, and it has since moved to 4.5. Nearly two-thirds of bets have been on the Tide - which makes sense given how much of a public team they are - so the line movement is consistent with expectations. The total has opened at 47.5. The Tide are 12-4 ATS in their last 16 road games but just 2-6 ATS in their last eight against teams with winning records and 1-4 ATS in their last five in November. The Tigers are 6-1-1 ATS in their last eight conference games and 4-1 ATS in their last five games in November. Auburn has lost twice - and one was to Clemson. In that game - and, I suspect, in this one - they were badly out-coached. I like a lot of what Auburn does, but I don't have a lot of respect for Gus Malzahn when it comes to crunch time, and he is sorely outmatched here. Alabama has better talent and dramatically better coaching. I am concerned about their schedule and I don't trust Hurts, but I don't see how I can avoid taking Alabama here. The Tide are the play against the spread.